Sailing in Phuket with SweetDreamers! With many years of experience in the charter service industry, SweetDreamers is a registered company in Thailand, based in Phuket. With an experienced and dynamic team, we endeavour to provide you unparalleled service, professionalism and value for money. With a vast selection of charters available, we will recommend the yachts which are most suitable to your requirements. We give you completely unbiased and objective opinions because we don't own these boats. You, our client, will no be paying any extra money whether you hire from us or from the charter owners directly. If you need any more details on chartering, procedures, prices and any other information, please don't hesitate to get in touch with us. Our aim is to provide you with service bar none. Our company's role is service, so feel free to ask us anything, no matter how big or small. You will find comments and testimonials from hundreds of guests on TripAdvisor as well as our guestbook. This will help you get a feel of others' experiences on enjoying our charters, cruises and day trips over several years. 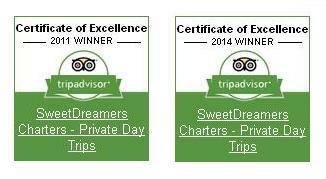 For our excellent service SweetDreamers has been awarded the TripAdvisor “Certificate of Excellence” for the second time (2011 and 2014). Certificates of Excellence are only awarded to businesses that provide the highest levels of customer service and meet and exceed expectations on every level. We are grateful to all of our customers, especially those who took the time to leave much valued feedback and photographs on the TripAdvisor website. With friendly people, amicable approach, abundant resources and plenty of knowledge, we have established a lot of steady clients who keep coming back to us. We have also linked up with all the top charter providers in Phuket so that you only have to come to one place – SweetDreamers – to get the most out of your charter or your cruise. 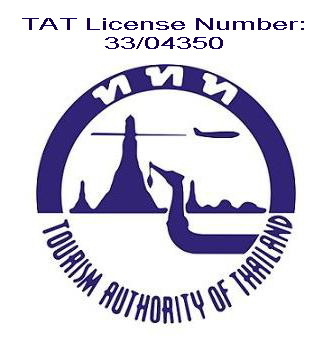 We live here in Phuket, we know the area and the tour operators. We'll be right there for you (in person) when you need us. Safety, cleanliness and boat maintenance have played a major role in our yacht selection through several companies. We have a large variety of yachts and cruises. You may join into an overnight cruise where you just charter a cabin, take a private day cruise or bareboat charter. If you want to relax while crew take care of navigation and other tasks, you can also take fully crewed charter, whether it's a sailing yacht, motor yacht or luxury yacht. We have highly competitive rates and provide you with the best boats and cruises on the island. You, our client, will no be paying any extra money whether you hire from us or from the charter owners directly. You will have our undivided attention as we give you professional and objective advice free of charge. You will be provided with an unique itinerary (on request) created just for you along with a few options and suggestions, to ensure that you don't feel restricted and can explore to your heart's content. You can choose to begin your charter in Phuket and end it in Langkawi, Malaysia according to your convenience. If you do decide to embark on a longer journey like this one, we will help you choose a suitable vessel. Since opening in 2009, we at SweetDreamers have been proactive participants in environmental and ecological projects around Phuket, whether it's above or below the ocean. Inspired by their sailing trip around Australia and Asia on their own yacht “Nadezhda”, partners Delphine and Igor felt compelled to share their life-changing experience. Driven by their passion of sailing and drawing inspirations from their adventures, they set up SweetDreamers charter company in 2009. What started off with just one sailing yacht and one join in sailing tour to Coral island in 2009 has grown to become the Phuket’s largest charter broker company offering services in 3 languages (English, French and German). Today, SweetDreamers organizes and offers the best join in cruises and charter yachts, available in Phuket. Whether it's on land or sea, SweetDreamers has been proactive in environmental projects in and around Phuket. Every year, we embark upon a project to clean up beaches in Phuket and nearby islands. We make efforts to guide our customers about matters of environmental awareness, like protecting coral reefs, beaches and preserving aquatic flora and fauna. We are pleased to announce Sweet Dreamers Charters won Service Excellence Award for Phuket in the 2016 Holiday & Tour Specialist Awards.